A three-day peace education “summit” met from May 13-15, 2011 in Newark, New Jersey’s elegant new Performing Arts Centre. The stunning opera house there, with its three balconies, can hold thousands. However, the house was far from full, though someone had given 1,000 free tickets to impoverished local youths. Each morning and each afternoon was divided into two equal parts: a panel with up to a dozen speakers, almost always including the Dalai Lama and two women Nobel peace laureates, Shirin Ebadi and Jody Williams, and chaired by Professor Robert Thurman, a specialist on Tibet. The other part consisted of workshops, each led by someone else from a roster of 96 international luminaries. These remarkable people included the authors Deepak Chopra and Marianne Williamson; former child soldier Ishmael Beah; disarmament experts Jonathan Granoff and Alyn Ware; Martin Luther King III; actors Goldie Hawn and Edward Norton; TV journalist Soledad O’Brien; historian Clement Alexander Price; development activists Jeffrey Sachs and Elizabeth Kucinich; meditation instructor Sharon Salzberg; religious leaders Robert A.F. Thurman and Rabbi Michael Lerner; indigenous leader Dave Courchene; and Congressman Donald Payne. Every panel also included an articulate youth (including at least one local seventh-grade boy) and at least one educator who works with youths. In a conference sponsored by Tibetans, it was not surprising that the emphasis was as much on “inner’” as on “outer” peace. Deepak Chopra used his time on the panel to update us on the effects of meditation on the brain and on human relationships. He referred to current research in neuroscience, which shows that meditation changes the structure and functioning of the brain. Moreover, Chopra called all our nervous systems “intertwined,” for we influence each other all the time—including people whom we don’t even know. Happiness is contagious. When you are happy, the odds that your neighbors or nearby relatives will also become happy increase between 8 and 34 percent. Moreover, the odds even increase that a person close to them, but who is a stranger to you, will also become happy. And even that stranger’s friends are slightly more likely to become happy—presumably because of your contagious happiness. Chopra offered a workshop on neuroscience and almost the whole audience tried to get into it. The crowd was so thick that I settled for my second choice—an interfaith pep talk. Still, on Day Two there was another workshop on a related topic; led by Dr. James Doty of Stanford University, it was also based on neuroscience purportedly proving that compassion and altruism toward others benefits one’s own happiness and health. The three-day program started with inner peace and led us from personal to interpersonal—especially family and school— relationships, then toward community relationships and, gradually, toward peace in the world. The early, social psychological, aspects of the conference were largely oriented toward supporting Newark’s teen-agers, only half of whom graduate from high school. Gang violence is pervasive. Indeed, two persons were shot on the streets during the conference. More than once, speakers alluded to the negative image that the city has borne since the 1967 race riot there. Unemployment levels are still so high that actual living conditions have barely improved, despite such ongoing grass-roots, hands-on interventions as the conference itself manifested. Still, Newark’s youth workers are remarkable. We met several of these wise, dedicated, caring persons. For example, there is an interfaith council that works with gangs—not to abolish them but to re-direct them into constructive influences. One foundation is funding the creation of a huge peace mural. Reportedly, some 500 kids have taken part in the project. The speakers themselves were all optimistic about the young persons, and indeed there are good grounds for hope. For example, there is an organization called Peace Jam that is spreading across the United States, through which the youth themselves are developing and executing programs that address the social origins of violence, both local and international. The laureate Shirin Ebadi is a middle-aged Iranian lawyer who specializes in defending the rights of women. She wears a professional-looking business suit and speaks Farsi, which her female translator renders in English, sentence by sentence. Far from flamboyant, there is nevertheless a fierceness about her. She addresses specific policies much more than “inner” peace, and she does not hesitate to criticize. She told the audience that the United States had sought out radical Islamists and armed them to fight against the Soviet-backed Afghan government, only to watch these insurgents become the Taliban foes whom they are now still fighting. Then she challenged us all, asking whether the original US policy was correct. She told us about the US government’s support of Saddam Hussein when he attacked Iran. The chemical weapons that he used in that eight-year war came from America, she said, asking: Was the US policy correct? Yet she soon qualified her position, telling us that she and some of her women friends long ago had been raped, and that she had wanted to do something drastic to the male organs that were responsible. Later she had realized that if she had been able to carry out such a wish it would have made her like the rapists, and she didn’t want to be like them. The next day, after hearing some of the neuroscientists talk about the health consequences of mindful meditation and compassion, Jody said she too had decided to take the idea seriously. Granoff spoke in a late panel, when the conversation had shifted toward global problems. He and another nuclear disaramanent expert, the New Zealander Alyn Ware, both were representing the International Peace Bureau. 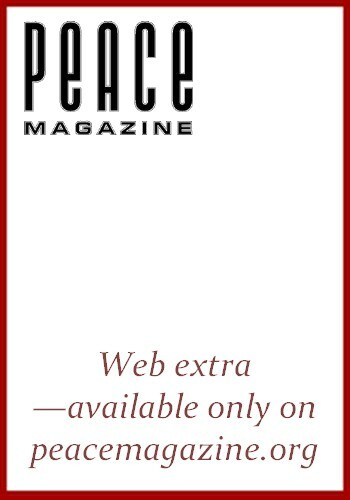 That venerable peace organization focuses on shifting the world’s priorities from disarmament to development. Granoff made the case for that shift, of course, and added his own emphasis: that the challenge is not just a financial matter—how to cut back on military spending and invest the money in more promising ways. The challenge is to make a more fundamental point: that what we need and want is human security—and the military simply does not make us more secure. More often the opposite is the case. Michael Lerner was another exceptionally powerful speaker on global issues. As the founder of the Network for Spiritual Progressives he has been promoting real solutions to human security problems, including the question of how to curb the negative effects of rampant corporate capitalism. (Several other speakers had mentioned the urgency of reversing current laws, which treat each corporation as a human person.) Lerner wants to institute a “Global Marshall Plan,” which would spend money on such projects as the Millennium Development Goals (Jeffrey Sachs’s brainchild). He would also issue charters to corporations for only five years, after which the renewal would have to be approved by a jury of citizens who scrutinize the company’s record for socially responsible behavior. At the end of the conference Rabbi Lerner convened a meeting of people who want to coordinate their next steps. Probably the most moving session of the conference was a workshop with Ishmael Beah and Dashaun ‘Jiwe” Morris. Beah had been a child in a Sierra Leone village when the war came and he was forced to join the rebel army. He has told his remarkable story in a book, Long Way Gone. Dashaun Morris had been a gang member from age nine and, like Beah, had participated in inconceivable acts of violence for several years. He is the author of War of the Bloods in my Veins. Both men experienced profound transformations and are working now to save other children from situations comparable to their own tragic stories, which they recounted to a hushed audience. Marc Levin is a filmmaker who often makes documentaries about gang life and street violence. He was watching his cameraman filming as this workshop finished and the audience arose to depart. Suddenly a black woman named Donna began yelling, protesting against the failure of the Newark’s municipal government—specifically Mayor Cory Booker—to solve the problems of the city’s youth, who are killing each almost other every night on the streets. It was not clear exactly what she wanted. “Turn your cameras back on,” we suggested to Marc Levin, but he merely smiled and shrugged. It seems that he has already filmed many such outbursts by Donna. Whenever there is a public gathering she turns up to shout her complaints. May Ishmael and Jiwe be happy. May Donna be happy. May Newark be happy. May all beings be happy.